The CG635 generates extremely stable square wave clocks between 1 µHz and 2.05 GHz. The instrument's high frequency resolution, low jitter, fast transition times, and flexible output levels make it ideal for use in the development and testing of virtually any digital component, system or network. Clean clocks are critical in systems that use high-speed ADCs or DACs. 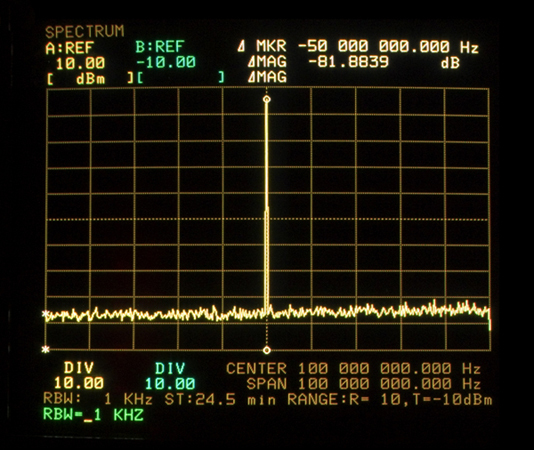 Spurious clock modulation and jitter create artifacts and noise in acquired signals and in reconstructed waveforms. The CG635 generates extremely stable square wave clocks between 1 µHz and 2.05 GHz. The instrument's high frequency resolution, low jitter, fast transition times, and flexible output levels make digital component, system or network. Clean clocks are critical in systems that use high-speed ADCs or DACs. Spurious clock modulation and jitter create artifacts and noise in acquired signals and in reconstructed waveforms. Clean clocks are also important in communications systems and networks. Jitter, wander, or frequency offsets can lead to high bit error rates, or to a total loss of synchronization. The CG635 can provide the clean, stable clocks required for the most critical applications. 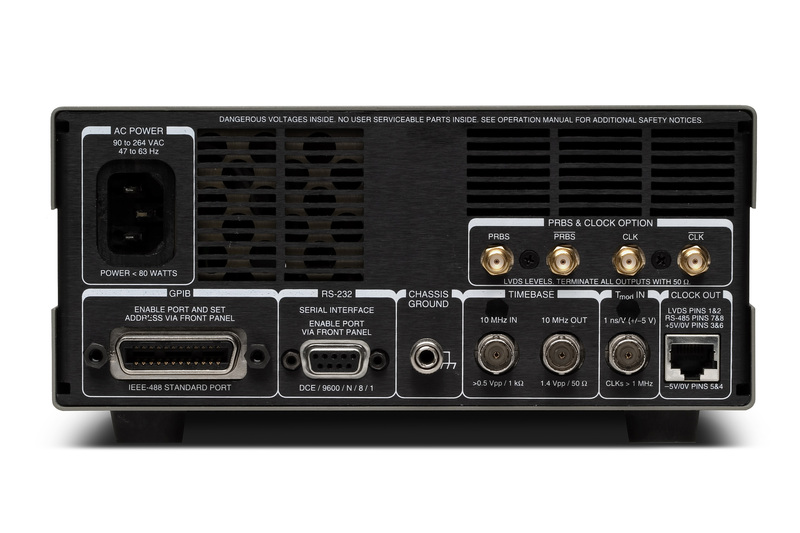 The CG635 has several clock outputs. The front-panel Q and -Q outputs provide complementary square waves at standard logic levels (ECL, PECL, LVDS or +7 dBm). The square wave amplitude may also be set from 0.2 V to 1.0 V, with an offset between -2 V and +5 V. These outputs operate from DC to 2.05 GHz, have transition times of 80 ps, a source impedance of 50 Ω, and are intended to drive 50 Ω loads. Output levels double when these outputs are unterminated. The front-panel CMOS output provides square waves at standard logic levels. The output may also be set to any amplitude from 0.5 V to 6.0 V. The CMOS output has transition times of less than 1 ns and operates up to 250 MHz. It has a 50 Ω source impedance and is intended to drive high impedance loads at the end of any length of 50 Ω coax cable. A rear-panel RJ-45 connector provides differential square wave clocks on twisted pairs at RS-485 levels (up to 105 MHz) and LVDS levels (up to 2.05 GHz). This output also provides ±5 VDC power for optional line receivers (CG640 to CG649). The clock outputs have 100 Ω source impedances and are intended to drive shielded CAT-6 cable with 100 Ω terminations. The differential clocks may be used directly by the target system, or with optional line receivers that provide complementary logic outputs on SMA connectors. The standard crystal timebase has a stability of better than 5 ppm. 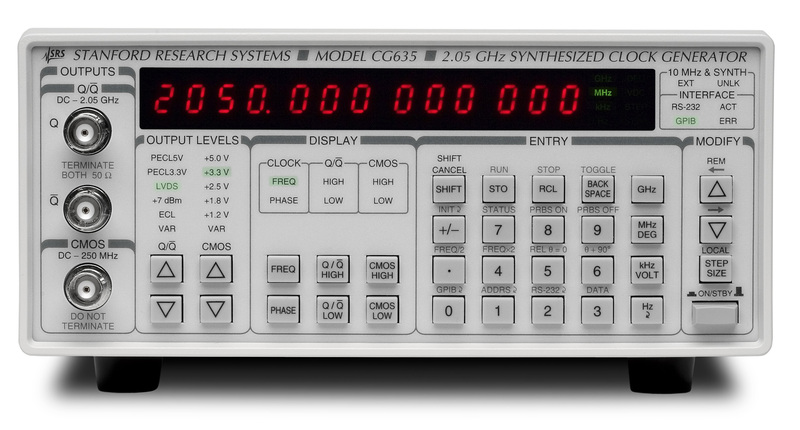 The CG635s 10 MHz timebase input allows the instrument to be phase-locked to an external 10 MHz reference. The 10 MHz output may be used to lock two CG635s together. There are two optional timebases. An oven-controlled crystal oscillator (OCXO) provides about 100 times better frequency stability than the standard crystal oscillator. A rubidium frequency source provides about 10,000 times better stability. Either optional timebase will substantially reduce the low-frequency phase noise of the synthesized output. The clock phase can be adjusted with high precision. The phase resolution is one degree for frequencies above 200 MHz, and increases by a factor of ten for each decade below 200 MHz, with a maximum resolution of one nano-degree. This allows clock edges to be positioned with a resolution of better than 14 ps at any frequency between 0.2 Hz and 2.05 GHz. The timing of clock edges can be modulated over ±5 ns via a rear-panel time-modulation input. The input has a sensitivity of 1 ns/V and a bandwidth from DC to over 10 kHz, allowing an analog signal to control the phase of the clock output. 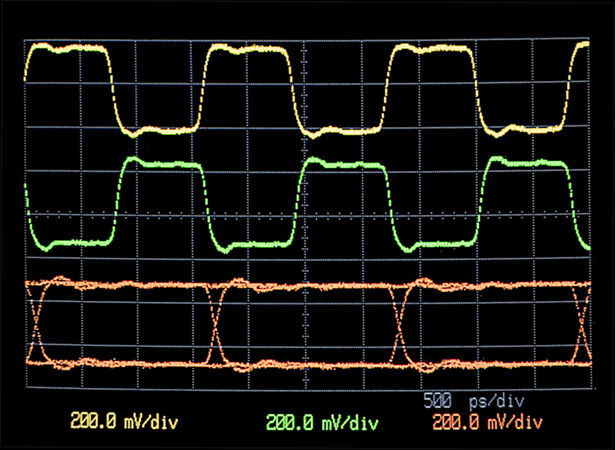 This feature is very useful for characterizing a system's susceptibility to clock modulation and jitter. With its exceptionally low phase noise and high frequency resolution, the CG635 replaces RF signal generators in many applications. Front-panel outputs provide square waves up to +7 dBm — ideal for driving RF mixers. Should your application require sine waves, in-line low-pass filters are commercially available to convert the CG635's square wave outputs to low distortion sine wave outputs. The CG635 can provide a wide range of clean, precise clocks for the most critical timing requirements. The instrument is an essential tool for demonstrating a system's performance with a nearly ideal clock, and for understanding a system's susceptibility to a compromised clock. The CG635 has the frequency range, precision, stability, and jitter-free performance needed to fulfill all your clock requirements. Computer interfaces GPIB and RS-232 std. All functions can be controlled through either interface. Non-volatile memory Ten sets of instrument configurations can be stored and recalled. Dimensions, weight 8.5"× 3.5" × 13" (WHL), 9 lbs.